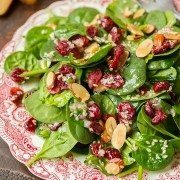 Pear Spinach Salad with Cranberry-Orange Vinaigrette – an enticingly fresh, flavorful and festive salad with a delicious balance of tart and tangy with a bit of sweet and salty. 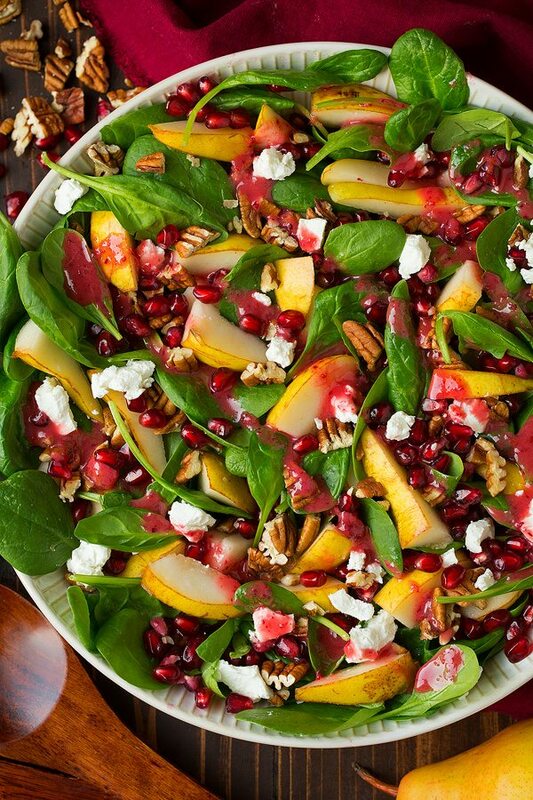 It’s would be perfect to serve on Thanksgiving or Christmas with it’s beautiful natural colors and seasonal fruit. 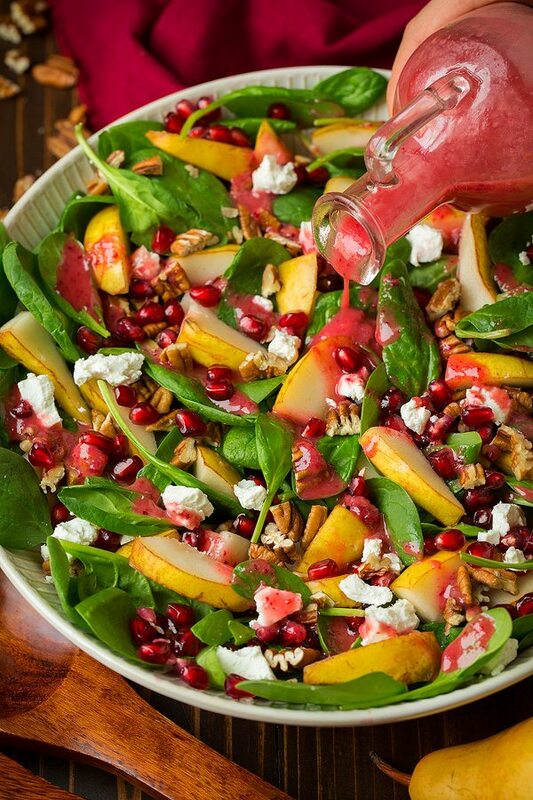 Have you ever tried adding fresh cranberries to your salad dressing before? It adds such a bright flavor and it’s the perfect way to use up some of the extra cranberries you may have left over from your favorite cranberry orange bread or scones, or holiday cranberry sauce. 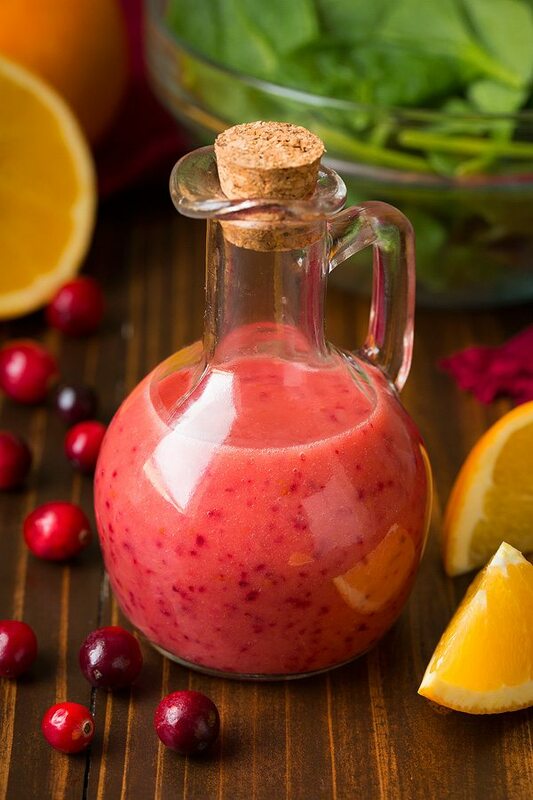 I often just freeze my left over cranberries and add a few to smoothies but I wanted to try something new with them, so I came up with this Cranberry-Orange Vinaigrette. At first, I was just going to go with a cranberry (only) vinaigrette but I felt it just needed a little more to it and orange always goes with cranberry. That bit of orange zest just completes the dressing. 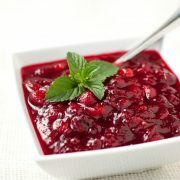 I also think the honey and sugar are a must because fresh cranberries can be sooo tart. Even though it is a rather small amount used here they still are quite bold so that little bit of added sugar and honey really tones them down. Of course you don’t have to make this exact salad, really this recipe is more about the dressing. Although it is a delicious salad if you want to try out the blend I liked to pair with this vinaigrette. We all have our favorites that are on repeat every year but it’s always fun to see something new grace the table. This is a smaller size salad, which feeds about 4 people as a side so just keep that in mind if you are preparing it for the holidays and a bigger group. You can stretch it and just add more spinach though as well, I just like a lot of the mix-ins (if I make it seem like ice cream and refer to them as “mix-ins” it makes salad seem that much more exciting right :)). 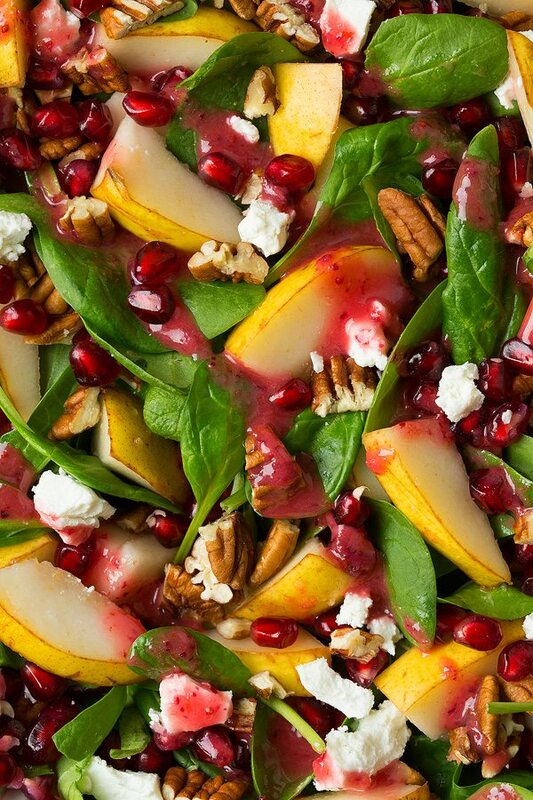 Another thing to keep in mind is that the pears are like apples, or even fresh basil. They brown rather quickly once sliced so just wait to cut them until you are just ready to serve the salad. I hope all of you are having a wonderful fall season! I love fall but I’m really hating this 5:00 darkness. Which is why we are setting up our Christmas tree tonight. This salad and my Christmas tree make early dark nights that much better. Try it soon! More Salad Recipes You’ll Love! 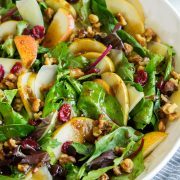 An enticingly fresh, flavorful and festive salad with a delicious balance of tart and tangy with a bit of sweet and salty. 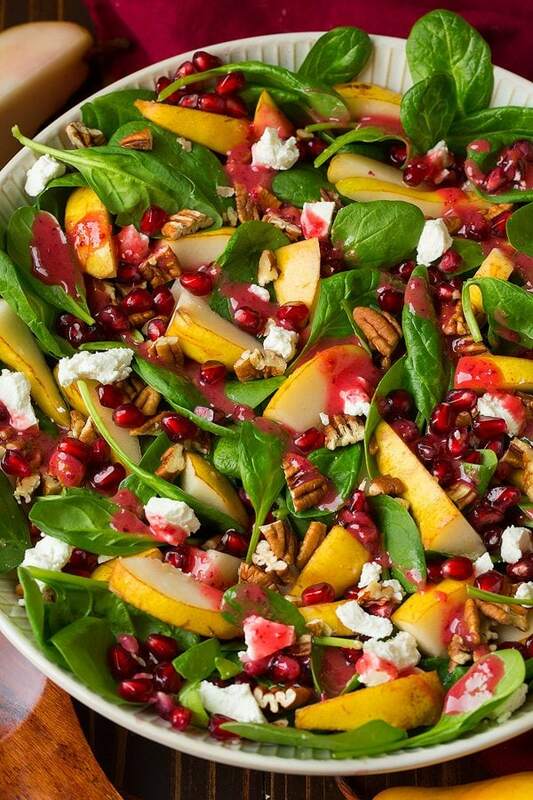 It's would be perfect to serve on Thanksgiving or Christmas with it's beautiful natural colors and seasonal fruit. For the dressing: Add all of the vinaigrette ingredients to a food processor (beginning with 1/2 tsp zest and adding more to taste as you go). Pulse until cranberries have been pureed into dressing. Transfer to a jar, cover and chill until ready to use. For the salad: Layer salad ingredients into a bowl. Drizzle desired amount of dressing over top (you'll likely have some left over) or top each individual serving with dressing. Serve immediately.